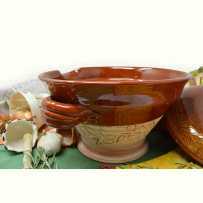 It’s an artisanal ceramic, made by a potter who reproduces the gestures of his predecessors which are more than four centuries old! The container is glazed on the inside and the top, and the base can remain plain, or receives a sgraffito decor on your request. It’s thus a unique piece, signed by the author, which you will also like to keep in decoration on a kitchen table. The piece is stamped by the potter. 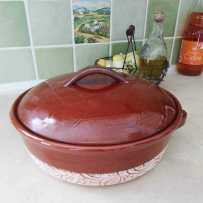 If you are convinced of the effectiveness of culinary pottery, we offer a range of recipients dedicated to slow cooking: gratins dishes, casseroles, pans and pots, tian and the daubiere of Provencal grandmothers. They are both from the same artisanal workshop in Vallauris, and are provided with advises to help you keep them for a long time.